This short article will describe the process of upgrading to EurekaLog 7. Upgrades from older versions (EurekaLog 6, EurekaLog 5, etc.) are sold with 50% discounts. 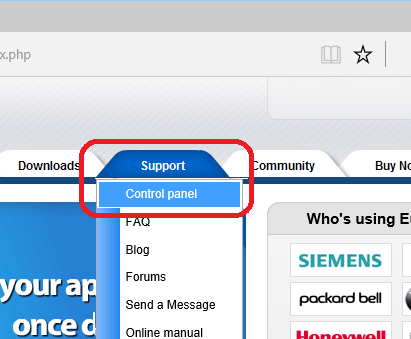 To buy upgrade you should log in to your control panel. If you forget your password - you can recover it by using this page. 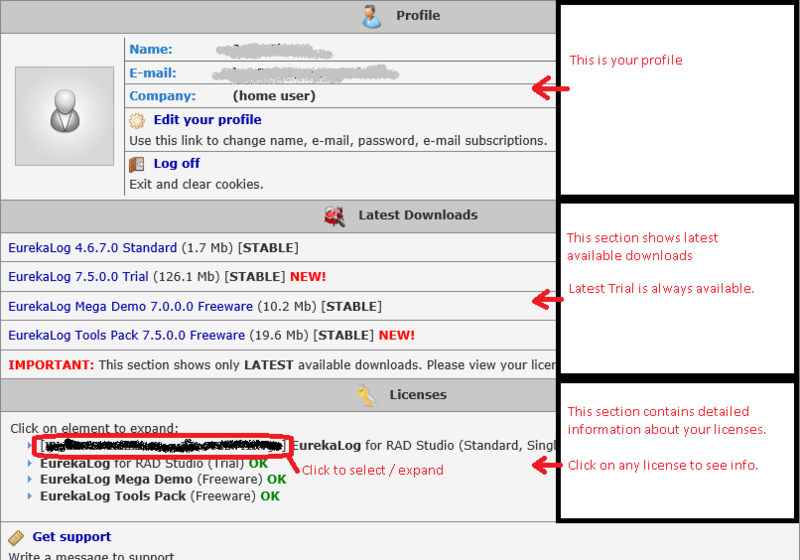 There is EurekaLog 4 license in the example above. Therefore, there are download links to full version of EurekaLog 4 installer, as well as links to download latest free Trial, tools, demos. Important: Please note that you have to be logged in. Otherwise you won't see upgrade options on "Buy" page. The content of the "Buy" page depends on your profile and licenses. You will see two section on the "Buy" page. First section allows you to purchase a new license. For example, you may use this to purchase additional seats. Important: Discounted options are only shown for logged in customers. You won't be able to see discounted prices if you are not logged in. There will be a block of options for each of your licenses. Use "Extend for 1 additional year" option to upgrade your old license to latest EurekaLog version. 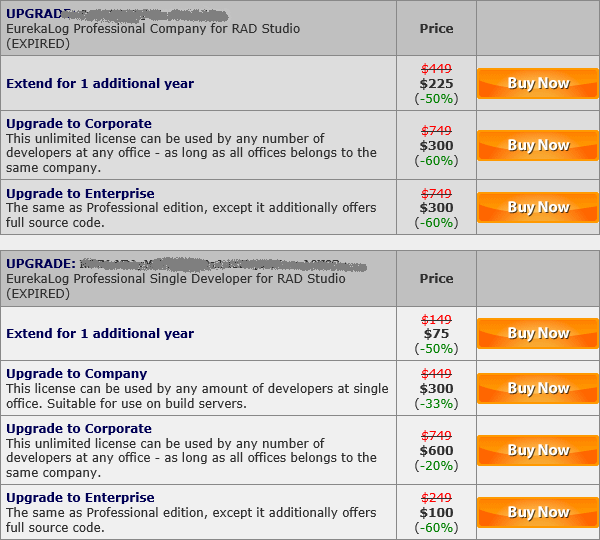 You will also be able to buy upgrade within your old version (for example, upgrade EurekaLog 6 Professional to EurekaLog 6 Enterprise, or upgrade Single Developer to Company) - for just a price difference between editions. If you can't use our direct "Buy" page - then you can use any of our world-wide resellers. 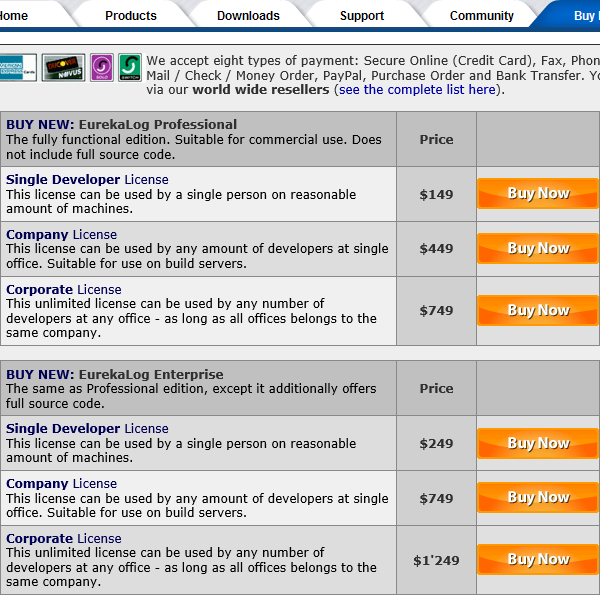 Pick a reseller and ask it to purchasing upgrade for your EurekaLog license. Once update is obtained - you will see download links to full version of latest EurekaLog installer in your control panel. 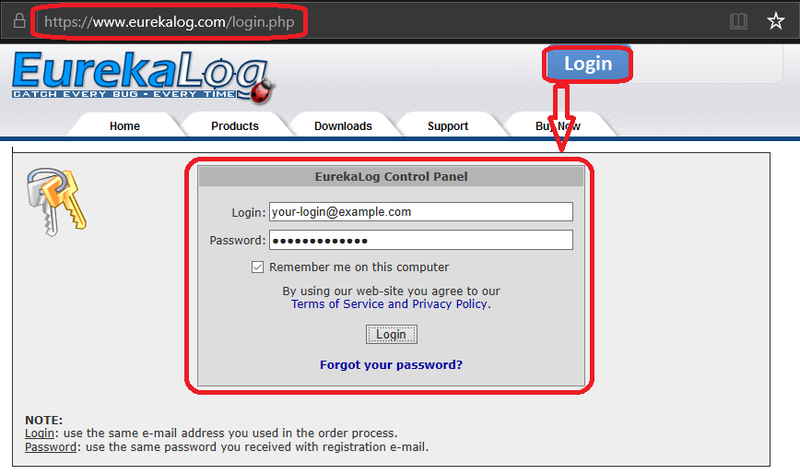 Be sure to use the correct login/password pair that is sent to you in order notification e-mail. Make sure this e-mail is not blocked. Check your spam folder. If you have any problems with buying/upgrading/licenses - ask us (sales department). You don't need to uninstall EurekaLog 6 before installing EurekaLog 7. Both versions could be installed on the same machine. You can switch between EurekaLog versions by using "Start Menu" / "Programs" / "EurekaLog 6" / "Manage EurekaLog in IDEs" (this option will appear after installation of EurekaLog 7) and "Start Menu" / "Programs" / "EurekaLog 7" / "Manage EurekaLog in IDEs" menu item (make sure to run both tools under administrator account). b. Click on "Install EurekaLog 6 (recommended)". b. Click on "Install EurekaLog 7 (recommended)". Be sure to close all running IDE instances when installing/uninstalling EurekaLog or using "Manage" tool. Of course, you can fully uninstall EurekaLog 6 and then install EurekaLog 7. However, you must be sure that your project will work. If you haven't tried this yet - then abandoning EurekaLog 6 is not a wise move. If you do not see EurekaLog 7 in your IDE - please use "Start Menu" / "Programs" / "EurekaLog 7" / "Manage EurekaLog in IDEs" menu item to activate EurekaLog (make sure to run it under administrator account). For other issues - please see our automatic troubleshooter or troubleshooting guide. To diagnose installation problems - please run C:\Program Files (x86)\Neos Eureka S.r.l\EurekaLog 7\Bin\InstallationDiagnostic.exe tool to generate log file. You can send this log to us. Additionally you may attach installation logs which can be found at: C:\Program Files (x86)\Neos Eureka S.r.l\EurekaLog 7\InstallationDiagnostic.log and Process.log. EurekaLog 7 contains A LOT of changes from EurekaLog 6. We beta-tested EurekaLog 7 for 1.5 years - about half year of public beta testing and 17 months of private beta-testing. And we done much to ensure that upgrade process will be as much painless as possible. However, we surely do not expect that upgrade process will go smooth. There always be problems. There are tons of real-life live EurekaLog-enabled projects around the world, and we just can not test them all. 1. Therefore, the first thing that you need to do - is to backup your project before opening it in IDE with EurekaLog 7 installed. Typically, you only need to backup your project files (i.e. like Project1.*). Then you can open your project in EurekaLog 7. 2. Once you have opened your project - please, review its options on each page. Make sure options are set to expected values. Alternatively, you may want to "Reset" options to defaults and make customization changes. 3. Try to compile your project. There may be errors due to changes in EurekaLog's code. The list of changes is available here. Alter your code according to this guide. If you encounter errors like "File XYZ was compiled with different version of ABC" or "Could not compile used unit XYZ" - then your project uses mix of old and new files. • Be sure to clear your project from old .dcu, .obj and other generated files. • Make sure that your project do not contain explicit search paths to other EurekaLog version. • Make sure that your IDE do not contain explicit search paths to other EurekaLog version. • Try to run a disk-wide file search for EurekaLog and your project files. See if there are any unexpected duplicates. • Sometimes it's possible that IDE do not update changes in settings. Try to run "Start/Programs/EurekaLog/Manage EurekaLog in IDEs" tool and click on "No EurekaLog" and then - on "EurekaLog 7 with IDE expert" (make sure you close IDE before doing that and make sure to run the Manage tool under administrator account). If this will not help - try to (re)setup search paths for your IDE as explained here. Please see also this article. Also, try troubleshooter and check common problems in our Knowledge Base. EurekaLog 7 has many changes. Some old ways of doing things were changed. Some are considered obsolete and replaced with other methods. You can find demos under "Start Menu" / "Programs" / "EurekaLog 7" / "Demos" menu item. You can find quick-start guides here. You can watch video tutorials here. You can read migration reference here. If you can't resolve some issue with upgrading - then just ask us (tech-support department).